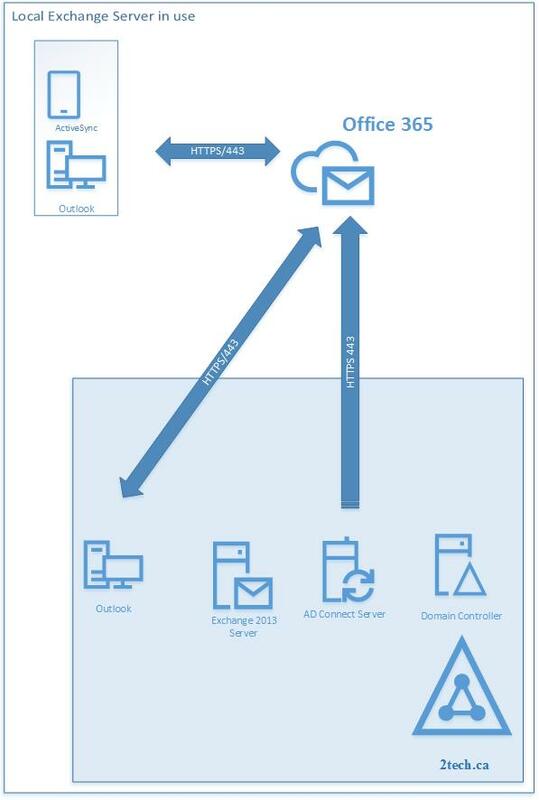 Office 365 accounts/mailboxes already provisioned in Office 365/Exchange Online. Users IDs and passwords are setup in Office 365. Local Active Directory has all account objects. There is no AD Connect Server locally Installed. There is no Exchange Server locally Installed. In this configuration, we are going to install local Exchange Server and use only supported method of syncing and provisioning accounts from local On-premises Active Directory. We will use local AD account second@9tech.ca to sync to already provisioned user\mailbox in Office 365 with primary SMTP second@9tech.ca. Edit both files to populate blank fields with missing data/attributes (tel number, address etc). Run the following command on local On-premises Exchange Server to create a remote mailbox using data from MSOL-Users.csv file. Run the following command on local On-premises Exchange Server to assign an additional email address to previously created Remote Mailbox using data from MSOL-Users.csv file. Run the following command on local On-premises Exchange Server to assign additional attributes to the local AD account using data from Exchange-Online-Users.csv file. Move mailbox to OU which is in AD Connect sync scope. Check if user’s status was changed from “In Cloud” to “Synced with Active Directory”. After those steps, all attributes for the specified users are copied from Office 365 back to On-premises Active Directory, a password is uploaded from Local Active Directory and all attributes of the mailbox are managed locally from Exchange Server.